Bella, twelve, and Marcus, thirteen, join Fabien Cousteau's research team off the coasts of South Africa and Australia as they try to find and tag an extraordinarily large great white shark. Inserts include facts about sharks and other marine animals, equipment used by researcher... read full description below. Two young explorers join Fabien Cousteau and his team to get up close and personal with great white sharks in this start to a series of graphic adventure novels. Junior explorers Bella and Marcus join famed explorer Fabien Cousteau and his research team as they embark on an ocean journey off the coast of South Africa, where the world's largest concentrations of great white sharks are found. Their mission is to investigate a sighting of a massive white shark, and tag it so they can track and protect it. Along the way, they'll encounter whales, seals, dolphins, penguins, and a colorful array of other marine life. They'll also enter a shark cage and come face to face with these powerful creatures. 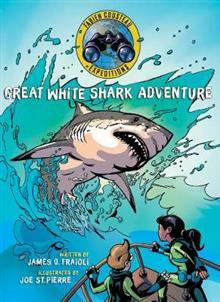 Dramatic, graphic illustrations and a compelling story help young readers discover tons of facts about sharks and other marine creatures. Children will also learn the many damaging myths about sharks, why they are so misunderstood, and what is being done to protect them from further exploitation and possible extinction.